Brother, can you spare sixteen hundred dimes? Going into Saturday night’s game against the Vancouver Canucks, the Los Angeles Kings had a financial problem, triggered by a longer-term salary cap problem. 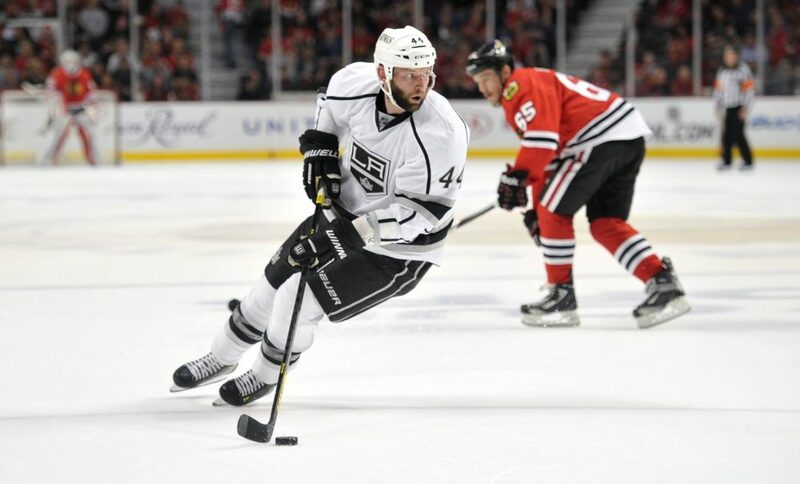 Defenseman Robyn Regehr left Friday’s practice with an unspecified injury and was unable to play against Vancouver. Naturally, every team in the NHL faces the same issue, and all have contingency plans to deal with it. The Kings were up against the NHL’s $69 million salary cap before defenseman Slave Voynov was suspended indefinitely by the league on October 20th for an alleged domestic violence incident. The Voynov suspension created perhaps an even bigger problem for Los Angeles than just the loss of the talented, fourth-year player: $4.167 million in dead cap space. That’s one heck of a lot of dimes. With Voynov’s status essentially frozen, Los Angeles was in the strange position of not having the financial flexibility every other team has to deal with injuries.How short were they from being able to call up a minimum-salaried player from the minors, you ask? Basically, the equivalent of a decent restaurant tab for two: $160. Granted, the Kings could elect to put Regehr on the long-term injured reserve list, but that’s an extreme move for an injury that appears to be day-to-day in nature. Despite being unable to afford calling up a replacement player, the Kings managed to pull out an on-ice victory over the visiting Canucks Saturday night at the Staples Center. The coaching staff mixed and matched the lines and defensive pairings to compensate for the manpower shortage they faced. In the end, the defensemen skated the following amount of ice time: 29:46 for Drew Doughty, 25:36 for Jake Muzzin, 25:30 for Alec Martinez, 19:42 for Matt Greene and 17:26 for Brayden McNabb. The Voynov situation could resolve itself soon. According to one report, Redondo Beach detectives will meet with the Los Angeles District Attorney’s office on Monday. However, there’s no certainty a decision will be made at that time. The Kings are off until Wednesday, when they play the cross-town Anaheim Ducks at the Honda Center, who sit in first place in the Pacific Division. Hopefully, Regehr will be back. If not, someone pass the collection plate around.